With a motto to earn huge clientele, we manufacture and supply Metal Staircase. The range is very stylish in patterns and designs. 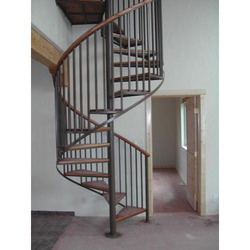 Our motto is to outshine amongst our clients by providing them with high quality range of Spiral Staircase. The range is perfect options for small space as it is compact in design and thus fit easily even in small space. Offered range is resistant to corrosion and very strong to bear heavy weights. Spiral Staircase requires very low maintenance. 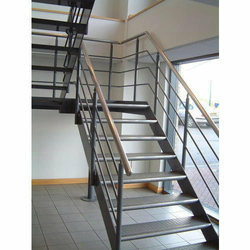 Amongst our clients we are enlisted as the well known provider of Stainless Steel Staircase. The array does not stain or rust and the ecstatic finish of the array remains same for years. Classy designs of the product enhance the appearance of the décor where it is placed. Stainless Steel Staircase is dimensionally accurate. Offered range is resistant to corrosion. We are manufacturers of MS Staircase, we assure high quality and great standards in our product. We are one experts in the market who offer this product at great price. We are manufacturers of Stainless Steel Stair Case we assure high quality and great standards in our product. We are one experts in the market who offer this product at great price. We have mastered the art of providing our clients with exclusive range of Mild Steel Staircase. Our product range is acclaimed in both national as well as international level for strength, finish and design. This array requires very low maintenance and can be installed easily. Mild Steel Staircase is resistant to rusting or decaying.